Space Creator: Everyone Deserves A Great Workplace! Posted on 27 June, 2018 . One of our six new ‘roles of engagement’ is the Space Creator, the role of creating, maintaining and enhancing the space where interactions take place. In many organisations this is synonymous with the workplace – the space where many of us spend 40+ hours every week and which can have a sparkling (or indeed crushing) affect on how we work, feel and perform there. We came across Neil Usher some years ago when he was working to transform the workspace at global mining giant Rio Tinto’s London office. This move, from a traditional City office with wood panelled corridors and many individual offices to an innovative space near Paddington station, was a real masterclass in 21st century thinking about space and contact, with different kinds of space, kitchens, conversation areas, reading points and a café (a key meeting place between inside and outside the organisation, kept outside the security cordon for maximum convenience). Neil was generous in his time and ideas when we were writing the chapter on Space Creator, and his contributions are prominent in our book. Neil has been writing on his WorkEssence blog about how work and workplace are intimately connected. 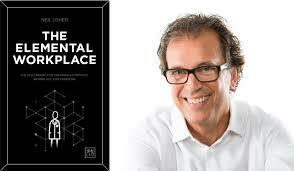 Now he’s gone one step further and authored his own book The Elemental Workplace: 12 Elements for Creating a Fantastic Workplace for Everyone. Starting from the rallying cry that ‘everyone deserves a great workplace!’, Neil builds the Why (the case for great workplaces), the How (to develop a great workplace) and the What (the 12 workplace elements themselves). Interestingly, he includes two How sections – the second being how to flex, adapt and redesign the workplace as people use it and discover their own ways of being in it. Change is happening all the time! The Elemental Workplace: A fully inclusive, sufficiently spacious, stimulating and daylight-flooded workplace, providing super-connectivity and localised environmental control, while allowing individual influence over a choice of comfortable, considered settings, offering convenient and secure storage for personal and business effects, affordable and healthy refreshments, and clean well-stocked washrooms. The following 200 pages of entertainingly written and thought-provoking text shows all the ins and outs of moving towards an elemental workplace, with lots of personal (and hard-won) experience to the fore. There are so many great points. Just one random example (produced by flipping the book open and starting to read) on page 172, Neil talks about the relationship that facilities management people have with their workspace users. He says this should NOT be thought about in terms of ‘customer service’, but rather as a collegiate relationship – we are all ‘in it together’ when it comes to the organisation delivering to its external customers, we all use the space, and therefore we want to make the workplace as positive as possible – for everyone. In host leadership we think of this as the ‘Co-Participator’ principle – yes, we’re providing for our colleagues, and we’re also providing for ourselves and metaphorically eating the same food, working in the same space. This balance between serving and participating is key in host leadership and it’s great to see it coming over here too. In short, this book is a must-read for anyone interested in creating better workplaces and interaction spaces. And if you’re reading this blog, that probably means you.